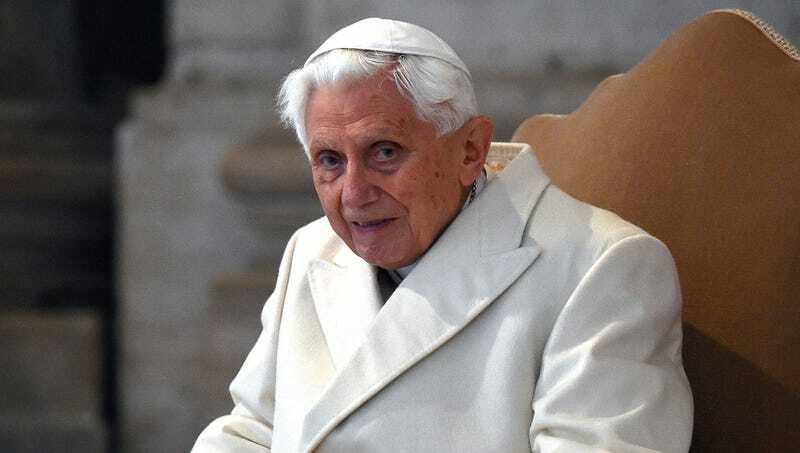 VATICAN CITY—In a charitable act he hoped would protect future pontiffs from suffering the same spiritual fate that he had endured, retired Pope Benedict XVI pledged his soul to the Vatican Friday for purposes of ecclesiastic research following his death. “As a former Bishop of Rome, my soul has been exposed to spiritual conditions one only experiences while sitting on the Chair of Saint Peter,” said the Pontiff, whose abstract spiritual essence will be archived alongside hundreds of papal souls such as Pope Innocent IX and Pope John Paul II in the Vatican’s Apostolic Soul research library, where it will be dissected and studied for insight into the long-term effects of papacy on the immortal spirit. “Obviously, when you join the clergy you consciously accept certain risks. But the more the experts at the Vatican can learn about how, say, the Light of Christ in your soul diminishes year after year in the Holy See, the more we can do to prevent that in future High Pontiffs.” The former pope added that his soul would do far more good in the Vatican’s research department than wasting away in the run-down celestial ghetto to which Popes are consigned in the event they reach Heaven.